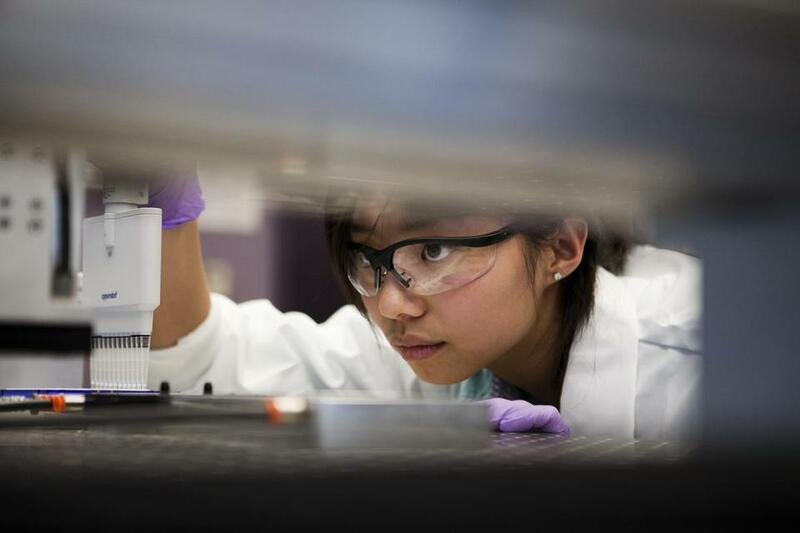 In 2012, lab technician Sherri Wang worked at Gen9, which produced a gene printer that could produce large quantities of genes and nucleic acids. On a Tuesday evening in mid-December, a small group of software developers and sales and marketing staffers gathered for drinks at Beat Brasserie in Harvard Square. It was during that week when office holiday parties were at full boil, and year-end bonuses were being doled out. But this was a more subdued affair. Everyone present had been laid off from a Cambridge biotech company called Gen9 the previous week. Startup shutdowns are far from rare. But the story of Gen9, founded by a trio of researchers from Harvard, MIT, and Stanford, illuminates how difficult it can be to turn bleeding-edge science into a sustainable business, even with $50 million from investors to help get things off the ground. The story begins — sort of — in 2009, when Gen9 was started in Cambridge. But in some ways, the company was a reboot of an earlier Cambridge outfit, Codon Devices, founded in 2005. It shared several of the same scientific founders and acquired some of the patents from the earlier venture. Codon raised and spent $44 million before shutting down in 2009. The vision of both gene-making companies was, as venture capitalist David Berry puts it, to “be the proverbial blue jeans supplier for the gold rush” that was happening. If you needed custom-crafted DNA for your project in a university or pharmaceutical lab, you would simply send the genetic code over the Internet — a string of As, Gs, Ts, and Cs representing the chemical composition — and you’d get a box packed with the DNA you needed via FedEx. If successful, Gen9 could become the Levi Strauss & Co. of this new realm — a dominant and enduring brand known the world over. The company developed some amazing equipment to manufacture custom strands of DNA, starting with a device called the gene printer, which worked a bit like an inkjet printer. Gen9 received its first order from a paying customer in March 2012. It eventually grew to about 40 people in an office building overlooking the Charles River. Gen9 attracted funding from the Kraft Group, the investing arm of the family that owns the New England Patriots. Its website bubbled about “the limitless possibilities of synthetic biology” in designing pest-resistant crops or cutting the costs of paper manufacturing — a big business for the Krafts. And last June, the company said it had landed the biggest contract in its short history, and one of the biggest deals ever for the synthetic biology business. A Boston company called Ginkgo Bioworks would buy 300 million “base pairs” of DNA from Gen9 — a seven-figure contract, according to Gen9’s former chief executive, Kevin Munnelly. Ginkgo had just raised $100 million; it would use the DNA from Gen9 to reprogram yeast, for example, to produce an artificial version of rose oil for a perfume company, rather than gathering tons of rose petals. The deal felt like an enormous victory for Gen9, which set about doubling its production capacity. Munnelly, the company’s former chief executive, says that in the latter half of 2016, he was exploring either raising more venture capital funds to keep the company going, or selling it. He noticed there was more investor interest in companies that were using synthetic biology to make a product, like a drug, than a “picks and shovels company” like Gen9, supplying the DNA. Employees thought new money would come in in July, then August, then September, Bonilla says. “You started getting worried when it didn’t happen in November,” he says. By that month, the company was telling its outside contractors to stop working. In December, when the first round of layoffs happened, Gen9 also began discussions with its largest customer, Ginkgo, about the possibility of buying the company. An agreement was completed Wednesday. Ginkgo chief executive Jason Kelly says it will be a combination of cash and Ginkgo stock (both companies are privately held), but he wouldn’t disclose the amount. Ginkgo will bring on just 10 of Gen9’s former employees — not including Munnelly or Bonilla — and acquire the company’s production equipment. As Ginkgo grows, it will use the capabilities that Gen9 developed for its own purposes. One benefit, Kelly says, will be speeding up Ginkgo’s work — rather than waiting four to six weeks for an outside supplier like Gen9 or Twist Bioscience, a San Francisco-based rival, to crank out the genes it needs. Berry, a partner at Flagship Pioneering in Cambridge, has a similar take: Just because scientists figure out how to do something dazzling doesn’t mean a business can be built upon it. Unlike the microchip industry, where lots of people figured out things to make and sell as chips got less expensive, “the knowledge of what to do with cheaper and cheaper genes is not there,” Berry says.